DV18DGL Combi Drill. 1x DV18DGL Combi Drill. Battery: Lithium Ion Slide-Type. Compact and powerful machine. WH18DGL Impact Driver. Maximum Torque: 55Nm. 13mm single sleeve chuck with spindle lock. Earn 149 Loyalty Points Add to Compare ListAdd to WishlistSKU: HITKC18DGL/JA EAN: 4966376237135. Even when working continuously, the 36V MULTI VOLT tools are less likely to stop due to overheating than their 18V counterparts. Carry Case. Soft64Nm (566in.-lbs.). Hard138Nm (1,220in.-lbs.). Soft Wood102mm (4"). 3 x BSL1850 18V 5.0Ah Li-ion Battery. New robust aluminium gear case. High performance Röhm chuck with spindle lock. Compatible with the range of Hitachi 18V slide Li-Ion batteries from 1.5Ah to 6.0Ah. DS10DFL lightweight Drill Driver. Free-standing design allows drill to stand on its own when not in use. Free-Standing Design allows drill to stand on its own when not in use. Faster Impact Driving with a no-load speed of up to 2,500 RPM and a 3,000 BPM impact rate. HiKOKI DV18DBXL 18v Brushless Combi Drill HiKOKI WH18DBDL2 Brushless Impact Driver Combi drill with brushless motor technology. Ultra compact impact driver with brushless motor. Compact body at only 204mm long. 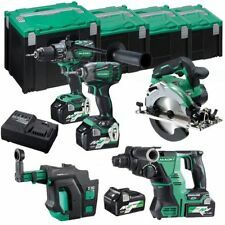 Hitachi KC18DGL/JA 18v Cordless Twin Kit Combi Drill & Impact Driver. DV18DGL Combi Drill Features / Specifications Battery: Lithium Ion Slide-Type. No-Load Speed: 0 - 350 / 0 - 1,400 rpm. Forward and reverse rotation switch. The Hitachi KC18DGL consists of a DV18DGL Combi Drill and the WH18DGL Impact Driver for ultimate power in a lightweight design. The Hitachi DV18DGL is a powerful 18v combi drill with an ergonomic slimline soft grip design, featuring an electric brake and spindle lock. HiKOKI DV18DSDL/JW HiKOKI WH18DSAL/JW Forward & reverse switch. Lightweight slide-in Li-Ion batteries. 33% increase over previous battery capacity. Impact rate: High: 0-27000/min, Low: 0-6000/min. Raised body mouldings for extra protection against dust and dirt with a slimline soft grip handle. Has a forward & reverse switch, spindle lock, and a battery level indicator for ease of use. WH 18DSAL Impact Driver can produce a high torque of 145Nm. Sadly instances of fraud are on the increase. Impact Rate: 0-6,000/0-27,000/min. Plus the following standard accessories: a side handle, driver bit, and carrying case. Spanners- Open End. Spanners- Box. HIKOKI KC18DGL 18V CORDLESS 2 PIECE KIT - COMBI DRILL / IMPACT DRIVER (2 X 5.0AH BATTERIES). Compatible with Hitachi 18V slide battery. 13mm single sleeve chuck with spindle lock. Single-Speed Variable & Reverse. 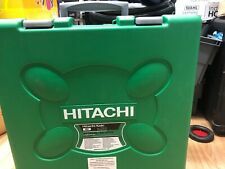 Hitachi 18V Cordless HXP Lithium-Ion 4 Tools Kit KC18BDL, Large Bag 2 Batteries. High power HXP Li-ion battery technology reinvents the way the world uses cordless power tools. Two BCL1815 HXP Li-ION 18V Batteries. 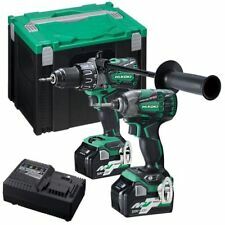 MS17HIT18V Hitachi DV18DGAL Combi Drill 18 Volt 2 x 1.5Ah Li-Ion. The Hitachi DV18DGAL Combi Drill has a lightweight, compact design that is ideal for working in confined spaces. The forward/reverse switch makes it easy to switch between applications. 1 x 18 Volt 18 Volt DV18DGL Combi Drill with a high power motor. It has a 13mm single sleeve keyless chuck, a spindle lock, electric brake and a soft-grip handle. No Load Speed: 0-350/0-1,400/min. No Load Speed: 0-2,400/min. 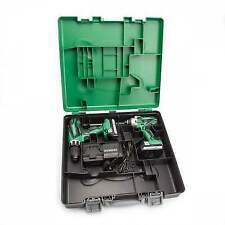 Hitachi HXP Power Tool Set. Runs on Li - Ion Battery. The saw has been used but the drill and light are NEW. ~ NO BATTERIES INCLUDED. 12V Peak Cordless HXP Lithium-Ion 3/8 in. Micro Drill Driver - DS10DFL. 12V Peak Cordless Lithium-Ion 1/4 in. Hex Impact Driver - WH10DFL. 12V Peak Cordless Lithium-Ion Micro Flashlight - UB10DFL. (2) 12V Lithium-Ion Batteries. The DS18DSAL features a comfort-grip handle, a belt clip, and an LED light to make the tooling experience more comfortable and enjoyable for the user. Models: DS18DSAL and BSL1815X. Drill Driver: DS18DSAL. Model: WH18DGL / BSL1815S. The Hitachi WH18DGL impact driver is a powerful, yet compact addition to the Hitachi 18V cordless tool series. This impact driver has the power to drive stubborn screws and bolts, and can do so in tight quarters. The CR18DGL reciprocating saw has a 1" stroke length and 3,300 SPM to allow for easy and fast cutting. The CJ18DGL has a stroke length of 1" and 2,400 RPM. MPN: KC18DG6LPA. The Hitachi CJ18DGL 18V Lithium Ion Jig Saw has a stroke length of 1" and 2,400 RPM. Model: DS10DFL2 / BCL1015S. The 2-speed gear setting allows the user to match the appropriate speed to the application. The Hitachi BCL1015S battery features the revolutionary Hitachi Lithium-Ion technology. 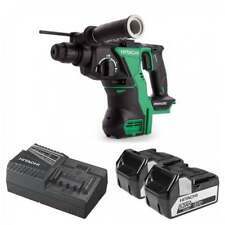 Hitachi 2-Tool 18-Volt Lithium Ion Brushless Cordless Combo Kit. See pictures. Drill, driver, and battery. This Drill Combo Kit is the first in Hitachi's Compact Professional series featuring an 18V Lithium Ion slide battery. It is impressively lightweight and compact at 7.7" in length and weighing only 3.3lbs. The 2-speed gear setting allows the user to match the appropriate speed to the application. Model: DS10DFL2 / UB10DL. Model: DS10DFL2. The compact ergonomic design allows the user to get into the tough to reach places. 1 x Hitachi DV18DSDL 18V Combi Drill. 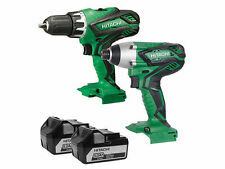 1 x Hitachi WH18DSAL 18V Impact Driver. 1 x Driver bit. DV18DSDL combi drill. C18DKL/JB 2 PIECE 18V CORDLESS KIT WITH 5.0AH LI-ION BATTERIES. WH18DSAL impact driver. 2 piece kit with high capacity 5.0Ah Li-Ion batteries. Multiplex protection circuit for maximum battery life. 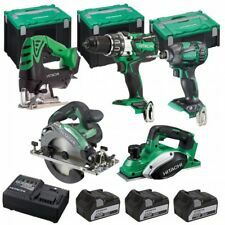 Hitachi DV18DGL/JM 2x3.0Ah Li-ion 18V Cordless Combi Drill Kit. 2 x 3.0Ah Li-ion batteries. 13mm single sleeve chuck with spindle lock. Forward and reverse rotation switch. The Hitachi KC18DKL 2-piece kit contains the following Hitachi Part no: KC18DKL/JA5. Raised body mouldings for extra protection against dust and dirt with a slimline soft grip handle. Has a forward & reverse switch, spindle lock, and a battery level indicator for ease of use. Hitachi Part no: KC18DGL/JE. No Load Speed: 0-350/0-1,400/min. 1 x 18 Volt DV18DGL Combi Drill with a high power motor. It has a 13mm single sleeve keyless chuck, a spindle lock, electric brake and a soft-grip handle. New Hitachi KC18DG6L 18-Volt Lithium-Ion Tool Combo Kit, 6-Piece. Condition is New. Shipped with UPS Ground. Kit includes (2) 18V Lithium Ion Compact 3.0Ah Slide Type batteries BSL1830C (339782) for less weight in a more compact size than a traditional 3.0Ah Li-ion battery. Kit includes the CR18DGL 18V Lithium Ion Reciprocating Saw has a 1" stroke length and 3,300 SPM to allow for easy and fast cutting. Part Number: DV18DBL2. Item model number: DV18DBL2. Batteries: 2 Lithium ion batteries required. (included). Battery Cell Type: Lithium Ion. Style: Includes Two Batteries. Product Details. /lbs of torque in an ergonomic, lightweight (3.8 lbs) design. /lbs of driving torque for heavier applications. Kit includes the CR18DGL 18 V lithium ion reciprocating saw has a 1 In. stroke length and 3,300 SPM to allow for easy and fast cutting. Battery Type: Lithium ion (Li-ion). WH18DGL: 1/4 In. Total Kit Weight (lbs.). Number of Tools Included: 2. Brushless: No. Jigsaw Included: No. Reciprocating Saw Included: No. Impact Driver Included: No.